The Saturn Junkyard: Welcome Caleb! b.) An encyclopaedic knowledge of video games of yore, and skills in terms of uncovering hidden nuggets of information, bits of gaming history and even the emulation/homebrew scene which is thriving out there! c.) Pretty nifty media skills, knows his way round a video camera and editing suite and produces his own movies! So The Saturn Junkyard is now a joint venture which should hopefully result in a greater output of Saturn related ramblings for the three people who read the site! So with fanfares, drum rolls and fireworks we say "WELCOME CALEB! HERE'S TO THE FUTURE!" I look forward to it. For some reason, the Saturn has become my collectable du jour recently and I am always looking for new information about it. Especially decent games that have held up to the sands of time. I am finally getting around to grabbing a copy of the original Panzer Dragoon (which is the very reason the I wanted a Saturn over a PS1 when they were originally out). I should be getting this week. The price is a little steep ($15) but it is in excellent shape with the case, booklet and disc being in almost new condition. Hopefully all works out and I don't end up in the police blotter. I am getting off of someone that listed it on Craigslist that sounded a little shady (dodgy to you accented types) when I spoke with him on the phone. 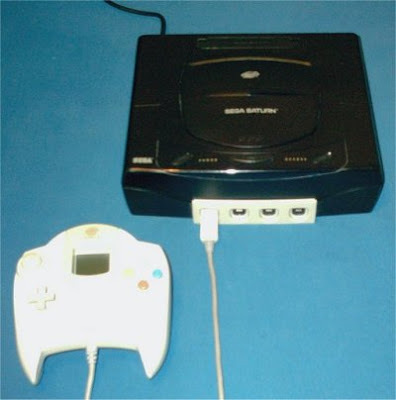 As an aside, does anyone know if there were wireless controllers available for the Saturn? Were they any good? If not, were there extensions for the wired controllers? Keep up the work on the site. I've been enjoying it. Well, won't be verbose really, but, WELCOME CALEB! Well good luck caleb on making this site that much better. 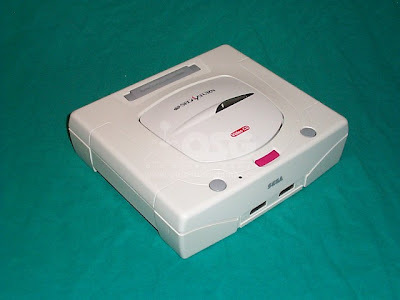 oh, yeah and I dont plan on buying a saturn no time soon , so I was wondering if you guys could make this the saturn/dreamcast/ whatever you want to say junkyard. Anywho... Welcome Caleb. Look forward to reading what you have to say. Ok first off let me say that I will NEVER live up to that intro. Next I apologise for not blogging today. My first blog on the Saturn controlers will have to wait until tommorow. "He is committed to 'retro gaming' to the point of resolutely refusing to be swept up in the 'next gen' hysteria that has the rest of us fools drooling..."
Hmm...if someone sold me a working Wii, 360 or PS3 for under a $100 I would gladly buy it. But to pay the insane prices of todays video games when there is NO video games out there that I really want to play is nuts. I have a ton of great games that I like to play already. If graphics REALLY mattered nobody would be buying NES games to play on their Wii and old consoles would be free. They are and they aren't. So I am not insane for forsaking the new breed of console. I just don't feel the need to buy into it yet. Glad to see you've been enjoying the Saturn Junkyard, Pierre! as promised it's going to be a lot more 'on-topic' from now on focusing on the Saturn. 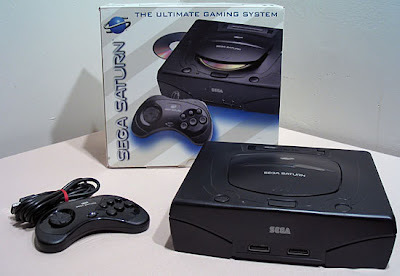 That's not to say we won't mention other consoles from time to time, but it will now be a Saturn based gaming site. Honest! The addition of the mighty Caleb to the team will hopefully turn up some good stuff! He was enlisted on the strength of his knowledge, blogging eloquence and media skills.